Tryptophan is an essential amino acid, therefore, for its replenishment there is only one source – food. Tryptophan in the human body is directly converted to serotonin – a compound that causes mental relaxation and creates a sense of emotional well-being. 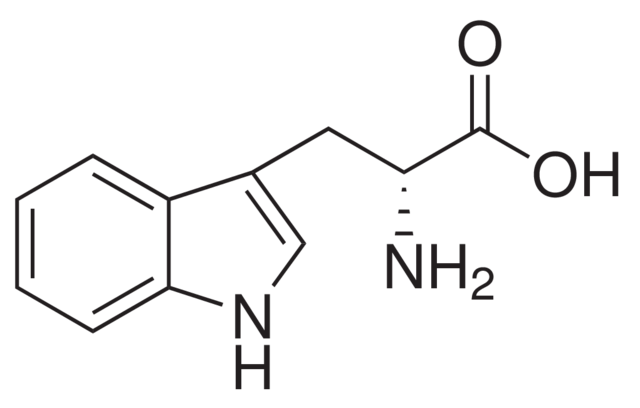 Serotonin, in turn, is the precursor of melatonin, which regulates the biological clock. People who are depressed have few serotonin and tryptophan in their blood. Their low content in the body causes depression, anxiety, insomnia, attention disorders, hyperactivity, migraines, headaches, stress. It’s terrible to imagine what would happen if there were no tryptophan in our body. Then we would probably suffer from endless insomnia, excessively fat, or, conversely, would lose weight beyond recognition, would be irritable, aggressive and restless. But, fortunately, these are just terrible thoughts. In fact, in our body there is a tryptophan, which is an indispensable assistant. We should not forget that it must constantly enter the body with food. If you constantly get tired, feel irritated or even unhappy, if you have sleep disturbances, then it is likely that your body lacks tryptophan. Tryptophan acts as a natural antidepressant, it helps to naturally cause sleep, reduce anxiety and stress. The secret of the action of tryptophan is that it affects the chemistry of the brain. Getting from the blood into the brain, tryptophan gives the command to produce serotonin. As mentioned above, serotonin is responsible for a good mood, has a relaxing and calming effect, increases efficiency. Doctors have recognized that biological supplements containing tryptophan are much better at dealing with depression and insomnia than drugs. Many people know that if you drink milk for the night, then you sleep much better. This is because the milk contains tryptophan. Tryptophan also helps against other emotional disorders, such as premenstrual anxiety. Bad habits, of course, are bad, but if it happens that you smoke or drink alcohol, tryptophan will come to your aid. It neutralizes the effect of nicotine, contained in cigarette smoke, helps the body cope with its harmful effects on the body. Tryptophan reduces some of the symptoms of biochemical changes in the body caused by alcohol. In addition, tryptophan interferes with the development of alcoholism. Surprisingly, a small amino acid is able to protect a huge human body. What controls the appetite of a person and, consequently, his weight? Of course, tryptophan. It reduces the craving for food, especially carbohydrate, helps to reduce body weight, normalizes appetite for bulimia and anorexia. Tryptophan relieves the depressive state and eliminates the superficial sleep that often accompanies diets. It helps to create a feeling of satiety faster, which leads to the consumption of fewer calories and helps to reduce weight. Tryptophan is a precursor of vitamin B3 (niacin), which can inhibit the primary formation of triglycerides (fat components), which prevents the development of obesity.